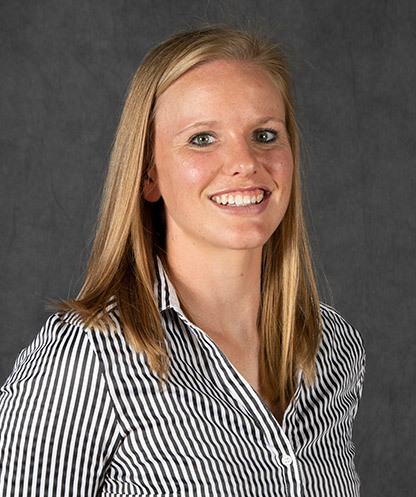 Emma Ostermann is entering her second season with the Utah women’s basketball program as the associate director for sports performance. Prior to Utah, Ostermann spent the two years as an assistant strength and conditioning coach at Northern Arizona. Ostermann was the strength and conditioning coach for men's and women's basketball and women's soccer at Northern Arizona. Her duties included designing all aspects of training for her assigned sports along with presenting on topics in her field at coaches' summits. While at Northern Arizona, all three teams she worked with saw their injury rate decline. Under her training and supervision, the men's and women's basketball players broke four team strength and conditioning records in 2016-17 (vertical jump, bench press, clean, back squat). Prior to her time at Northern Arizona, Ostermann served as a high-performance sport science trainee with the U.S. Skiing and Snowboard Association and was also a strength and conditioning intern with the U.S. Army, working primarily with the 10th Special Forces Group. She earned an associate of science in pre-physical therapy from Cloud County Community College before earning a bachelor's degree in kinesiology from Kansas State in 2012. Ostermann played basketball at Kansas State from 2010-12, earning Big 12 All-Academic selections in 2011 and 2012. Prior to her playing days with the Wildcats, Ostermann was a team captain at Cloud County. She received her master's in sports medicine with an emphasis in strength and conditioning from Colorado in 2015.